Let the C&S Bluebird Nuggets introduce you to a whole new way of feeding wild birds. These "Nuggets" are soft bits of suet, a high-energy formulation of animal fat traditionally used to attract birds which do not normally frequent feeders. Peanuts, corn, and raisins throughout this variety make it the perfect food for a bevy of birds, such as chickadees, wrens, and bluebirds. Suet is a great alternative to seed feeding and can attract a wide variety of birds, or only a select few if using specific flavors. Unlike traditional suet, which is produced as a cake, Nuggets can be mixed with seed and placed into traditional feeders. 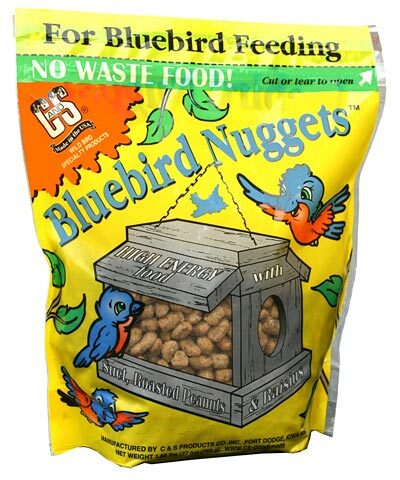 These Bluebird Nuggets offer a no-waste feeding system and a tasty treat for fruit and nut loving birds. Made in the USA. Note: This case pack includes 6 bags of the C&S Bluebird Nuggets, 27 ounces each.